Recently we sent a Tambo Teddy, Buckland Bill over the range to help Sue McDonald and the Buckland Recreational Club raise funds for the Royal Flying Doctor Service. The Buckland Recreational Club is a small community group of twenty who have a recreations ground approximately 100 kms west of Springsure, with a shed, tennis court, toilets and airstrip. Each year the group holds an event attended by around 100 people to raise funds to support the RFDS. Bill did the rounds in Springsure and visited the ‘Wings, Wheels & Rugby’ event at Rolleston where raffle tickets were sold to win him. Then he rocked up to the RFDS Field Day at the Buckland Recreation club and had the time of his life! The day started with a cuddle from club patron, Nesta Squire, he then went on to visit Emilee and Barb from the Remote Area Family Services and helped a friend who was learning CPR with Springsure Ambulance. 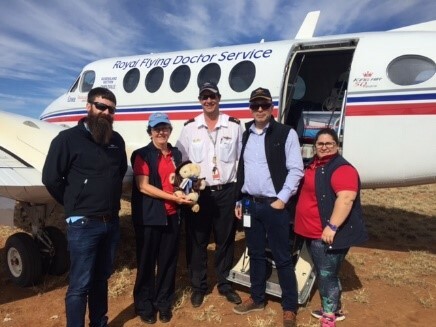 When the Plane arrived, Bill grabbed the opportunity to pose with the crew before helping Mary and Charles Tyson give Diane Dowrick, from the Charleville RFDS, a 90th birthday card to commemorate the organisation’s significant milestone. Nurse Courtney gave Bill instructions for healthy eating before he went to check out the spit that was cooking the pig for lunch. The children had been learning tennis skills though Bill was rather overwhelmed when they tried to teach him. As the whole day was about the RFDS, Bill felt it was important to check out the plane and chief pilot, Nick Tully was only too happy to give Bill and his friends a tour. Of course fund raising was the aim of the day and the auction was the highlight, Pat Kooyman won the bidding for the RFDS and took home the Tambo Teddy book. Finally, it was time for Buckland Bill to find his new forever home. The raffle was drawn, and Henry Symons’ name came out, Henry’s mother was delighted to pop Bill in his box to take him home to Springsure. The little community of Buckland raised a massive $1800 in funds for the Royal Flying Doctor Service and we are proud we were able to help!